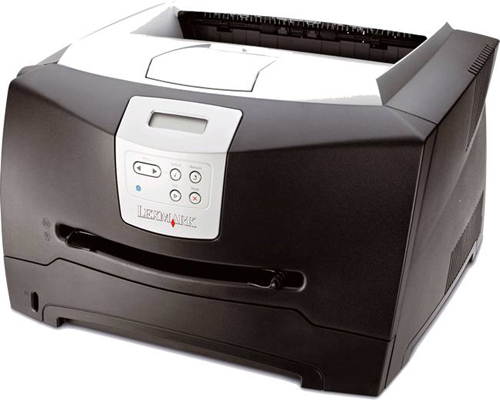 The Lexmark E340 Laser Printer is a powerful mono printer, providing amazing speeds and precise resolutions. The speed is up to 30 pages per minute and the resolution is 1200 x 1200 dots per inch, assuring every printed document will be crisp and sharp. You can add additional RAM memory, paper capacity and even get connected with it through wireless Ethernet. The printer is compact and affordable, fits every home desk or small office and delivers professional-looking documents. Laser printers are usually the best option for small organizations because of the high printing speed, low costs and efficiency. This model is not expensive, being the bottom end of Lexmark's range in business printing terms. Compared to its rival, the HP 1320, the Lexmark E340 is more affordable, powerful, compact and even looks better, with those squad Humvee lines and black and grey casing. The processor on this model is a 366MHz, improved from the one the Lexmark E332n has, which is only 200MHz. The RAM is 32MB, expandable to 160 MB if you need it. Comparing the Lexmark E340 with the HP 1320, the E340 is three times faster than the HP's and, not surprising at all, even the printing speed is better. The Lexmark E340 prints at a 28-32 pages per minute rate, though the official value is set at 30. Its rival only manages 21 pages per minute. For home use both of those speeds will be good enough, but if you own a small business, then you should go for the Lexmark. The E340 will give you the first page in 7.5 seconds, a second faster than its opponent. The printer quality is good, though you have to pay attention to the darkness level of the toner. If it's set too high, you'll see close shades of grey and black on the printer paper, so just reset the toner at the four mark. The default one is above this value, but use the one I gave you for optimal results. The software is easy to use. There are only four control buttons you can use and the menu is next to the LCD. The maximum resolution is 1200 x 1200 dots per inch, while the minimum is 300 x 300 dpi. The input capacity is 250 papers, thanks to the 250 sheet input tray. The standard output is assured by a small 150 sheet output tray. The optional paper cassette is a 550 sheet drawer. The maximum monthly duty cycles is set at 10.000 pages, which is a good value for a home printer. The printer weighs 8.8 lbs and the dimensions are 5.1 by 15.5 by 14.8 inches, which will probably fit most of the home or office desks. The Lexmark E340 is supported by any Microsoft Windows 2000+, MAC OS 9.2+ and Linux 9.2+. There are two standard ports, a Centronics IEEE 1284 Bidirectional Parallel and a USB 2.0. The printer supports the following media types: card stocks, envelopes, paper labels, plain paper and transparent paper. One of the few cons we found is that the Lexmark E340 can't be easily found at a reseller in the UK, so the only options are to get it from the US or from Lexmark directly. Sure, cartridges are easy to be found in the UK, but the HP 1320 has the upper hand here. Some people might just consider buying the HP because they will have it delivered to ones home or business faster. With most of the managers picking printers and office devices on brand loyalty, it will be difficult for the Lexmark E340 to become as successful as its competitor. The printer does not have a built-in duplexer, so the automatic two sided printing is not featured in this model. 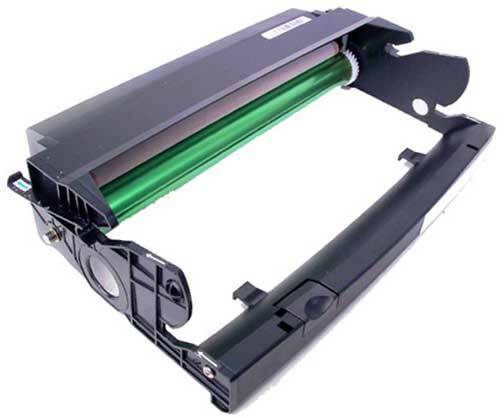 Review it: "Lexmark E340 "
The replacement cartridge for this printer should be a 34035HA Black Toner, which will be good for around 6,000 pages. Note that this is a high-yield laser toner cartridge, so it will also be more expensive than the normal one. 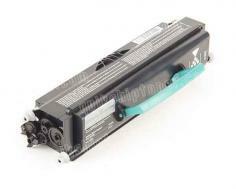 The standard toner cartridge the printer will come with, number 24035SA, will be enough for around 2,500 pages. The printer will come with the following: User Guide CD, cables and standard black toner.